PRNewswire/ -- Mitel® (Nasdaq:MITL) (TSX:MNW), a global leader in business communications, announced today that independent research firm Synergy Research Group has confirmed its position as the #2 unified communications as a service (UCaaS) vendor worldwide, coming within one percentage point of the #1 market share position based on subscribers. This news is another major milestone in Mitel's rapid emergence as a global UCaaS company. In the third quarter of 2017, Mitel also reached the one million subscriber mark for worldwide cloud subscribers. "In today's cloud-driven world, offering communications on an as-a-service basis has never been more important or relevant," said Mitel CEO Rich McBee. "Mitel's emergence as a UCaaS market leader, accelerated by the acquisition of ShoreTel and its UCaaS solution, was perfectly timed with the market's growth and migration to the cloud-based technologies driving customers' digital transformations. This recognition is an extraordinary way to close a transformational year for Mitel." Mitel provides organizations of all sizes with cloud communications solutions combined with productivity and team collaboration applications, enabling businesses to work more effectively and better serve their customers. This recognition from Synergy further validates Mitel's global transition and execution to a cloud-based business strategy for its customers. "We chose Mitel because they know the cloud inside and out," said Hector Ortega, Systems and Telecommunications Administrator of the San Diego Padres. "For most of the year, much of our organization is on the road. Mitel is clearly dedicated to giving its customers a consistent experience across all devices, which has resulted in a seamless progression of our communications as we've expanded to support our specific organizational needs." "Mitel has set a high bar for growth these past few years quickly cracking the million-customer mark," said Jeremy Duke, founder and chief analyst of Synergy Research Group. "The UCaaS market is moving at an accelerated pace. We continue to see cloud growth and innovation driven across the industry as leaders, such as Mitel, continue to help customers digitally transform their organizations and operations." Mitel was recognized as a Leader in the Gartner Magic Quadrant for Unified Communications for four consecutive years. Mitel is trusted by more than one million global cloud subscribers. 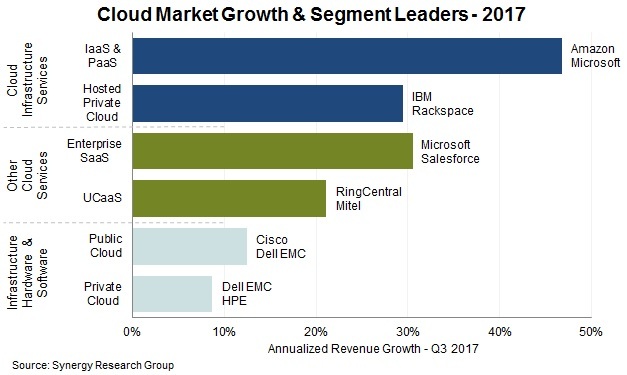 View the Synergy Research Group Overview of Q3 Cloud Market Growth across segments.